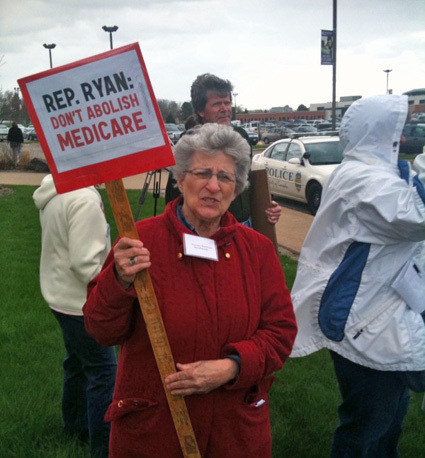 home » Politics » Ryan Plan Protests? Fourteen months ago a majority of Americans, anywhere from 52 to 58 percent depending on the politically bias nature of the polling, were against government-run health care. Today, anywhere from 60 to 74 percent of Americans polled are against the Paul Ryan plan to begin the gradual but eventual eradication of Medicare, which is, of course, a government-run health care system. Perhaps this is similar to Ryan, Wisconsin congressman and rising star in the Republican party, confidently scoffing at such polls with fancy rhetoric about “true leadership ignores polling” whilst having spent much of 2010 arguing that what he dubbed Obamacare was hugely unpopular with the American people and thus should have been abandoned for a more reasoned but wholly fictional right wing approach. Normal commentators might call this hypocritical or dumb, but this space would like to put forth the notion that what we’re dealing with here is an acute case of mass schizophrenia. At least that’s how it is for a nation of knee-jerk reactionaries, who apparently have the time and inclination to willfully engage in banal exercises like the answering of polls. These same hearty souls could be seen attending rallies and protests throughout both Obama’s 2010 health care tour and now Ryan’s latest foray into the national scene. Not sure what level of personal means or abject boredom precedes these activities, but it might be worth investigating for the rest of our bored and independently wealthy masses. Or could we extrapolate from this random information that people both love and hate national health care? One cannot fault Ryan, of course. Ryan is a politician, and a good one. His use of the bloated national debt and the results of the previous election to present his plan is not unlike the president, himself a nifty politician, using six years of Republican over-spending and an economic crisis to pitch his own. Also, it is not immaterial that it was Ryan who wrote this bureaucratic piss-in-the-wind and the Obama one was cobbled by his opponents. So it stands to reason he would presently appear pointless and make the majority of the polls reacting to it follow suit. At this juncture what appears most intriguing about all this, beyond the eerie similarities of both the 2010 National Health Care Reform Law and Ryan’s new economic plan being badly explained and presented by its supporters, is when someone on the same political side of the fence finds fault in the jiggering of national health legislation, like say a presidential candidate and former rising star of the Republican Party. When Newt Gingrich, a disgraced Speaker of the House and newly minted candidate for president of the United States — quite obviously over-coached and wearing a new suit of reasonable to hide three decades of gibberish — painted his colleague’s plan as “radical social engineering”, the truly irrational backlash began. It’s hard to please us. Ask us something today and we’re for it, and five or so weeks later, not so much. The crap Gingrich has taken for his overly centrist remarks about any unbalanced restructure of Medicare being unacceptable from either the Left or Right is unfair. That is until the schitzo bug hit again, and the man spent over a week in the kind of neck-wrench backtracking rarely seen among even the most contemptible salesmen. First Gingrich made claims that he meant none of which he said and then threatened to charge those who quoted him directly as liars. He also went so far as to say he would personally vote for a plan he originally said was “going too far”. Now, while being off the charts pathetic, these actions should not mean, as reported from FOXNEWS to the Wall Street Journal to the most Leftist rags, that his days-old candidacy is finished. Gingrich, who is often spoken of as a bright political mind even by his critics, has every right to have an opposing opinion to that of his party, especially its more entrenched fiscally conservative wing. Contrary to popular belief, like that of Gingrich somehow being a “bright political mind”, sucking up to TEA Party types did not guarantee victory last November. In fact, many Republican candidates who were either endorsed by or piggybacked the more extreme factions of the party were roundly defeated. Anyone with even a rudimentary notion of political maneuvering could see that Gingrich, whose Right Wing credentials should have been a given, was trying to appear as if he would work the middle with ease and appear moderate, even charming towards people he has repeatedly called vipers and charlatans, horribly weak appeasers of America’s enemies and a disease upon the land. It was a difficult high wire act that was fabricated and silly but hardly suicidal. However, it speaks to a wider point; that of the day-to-day shift in what is expected of our candidates and what the candidates may expect from us. Let’s face it folks, we’re crazy. There really is no other way to sugarcoat a fourteen month shift in how national health care is perceived; just as it is never perceived in the endless scuffle about the national budget concerns, which is ironically only a concern when considering the entitlements that people do not want to give up. This is why lunatics predicting the possible result of a presidential election eighteen months out is not only folly, but dangerous. Someone please tell me where Barack Hussein Obama was in the spring of 2007; sixty points behind Hillary Clinton? We have problems staying the course for eighteen days around here. And for those who might think this is the natural swing of events and there are subtleties ignored here, I humbly offer anyone to check out the vacillating mess that is found in the Iraq War polling from 2004 to 2007 or so. Monthly, sometimes weekly, the shifts were dramatic, as if people were watching the flowing tide of an NBA game, with the score changing by the second, all the while making overall assumptions on its eventual outcome. It may turn out that political pundits end up applauding Newt Gingrich for distancing himself from the Ryan plan, which is now taken on too much water for his party to support. Take for example the mass exodus in the Senate. But this is only in the short run, for there is still time for it to rally and then die and rally again.